I rushed the line out in front of West Hall, ducked through the doors, found Nintendo, and got in line back around two corners and a big angry man who was threatening to have people \"throw themselves out\" if they didn\'t keep the walkway clear. At the time it was 9:15. They said I was three to five hours back. 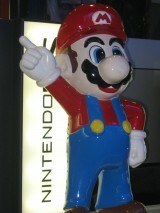 It was the beginning of a long exciting day with Nintendo...and Mario. At 9:30 it seemed I was making no progress. I moved once, ten feet maybe, and still wasn\'t around the first corner. The stress of standing in line began to set in. The questions \"Is five hours worth it?\" and \"Maybe I should try to come back tomorrow\" almost made me ditch out to just wander the floor. But then the line moved, once, and again and I was around the first corner. At 9:50, I was in front of what I can only call a \"video companion.\" You see, Nintendo knew their Wii system was in high demand (viciously popular, actually, since the line now wrapped an entire length around the massive booth) and the accommodated the patient with video screens of real people who would talk and ask random questions about the system. \"What are you most excited to play?\" asked a man from inside the TV. \"New Mario,\" I responded, then quickly added, \"Looks pretty boring in that white room, I hope they have you all nicely stocked with snacks.\"
\"Yeah they have a fridge and snacks,\" he said. I gave him the thumbs up as the line proceeded to advance in the direction of the Wii display. The next video companion was less interesting and seemed to have figured out that many gamers were uncomfortable talking to a giant screen. I asked her how long he had to stay there. \"A few hours,\" she replied. \"I think I get a break for lunch.\" Even if there was a real person behind the camera. We rounded another corner, and at 10:15, the entrance was in view. There were hundreds of people, filling the area like fat fills an artery, cluttering around playable demos of Super Mario Galaxy, Legend of Zelda: Twilight Princess, Wii Music: Orchestra, Red Steel, and various Wii Sports titles. After getting a quick, unimpressive demo of Red Steel, which showed aged graphics and a fidgety control scheme, I moved on to learn the controller. Obviously, I wasn\'t used to the controller. I had never held it before, though I had a good idea what I would be holding. The next stop was the controller \"Table Tennis\" demo. The demo seemed a little buggy (the computer was supposed to hit it back always, but liked to miss when I was up). But the controller was incredibly comfortable. I did my best and made a few points and thought I was good enough to take on the next Tony Hawk entitled \"Downhill Jam.\" Trick was, you had to hold the controller sideways and tilt it to move. This was trickier than it seemed at first, since you also had to use the d-pad, B button (the trigger at a sideways angle), and the 1 button to do tricks and grind. The 2 button worked as a tuck/jump function. On top of that there was a boost function done by shaking the controller. Simply, I kept forgetting that the controller had to tilt to turn ol\' Tony and I found the wall (or unforgiving railing) more often than a sweet indy to tailgrab. After taking Downhill Jam for a spin, I went over to what I felt was the premiere title for the Wii, Super Mario Galaxy. Luckily, Mario felt perfect with the Wii remote. Miyamoto-san has obviously been hard at work. The demo showed a multi-pathed course leading, ultimately, to one of three stars. Mario will not be alone on his trip, a little star (controlled by the remote\'s pointing feature) helps him gather items and defeat enemies. Moving the star quickly back and forth, aka. shaking the controller (either, we had both the remote and nunchaku) will send Mario into a spin attack. Jumping and shaking the controller does the same in the air. But there were more uses for this baby supernova than we first thought. The star can also be used to guide mario through space, launch him from sticky substances, and knock over enemies for easy pickins. The three paths were preceded by two bunnies (with gold and silver ears respectively) and from here, taking one of the paths led to one boss (a giant spider) or taking the other went to a huge metal robot that had to be scaled like in Shadow of the Colossus. While heading toward one of the bunnies, the paths diverged again, leading us to a flame-throwing octopus that donned a crown. Mario is controlling the best on the Wii so far (from what we\'ve played) and though we haven\'t played them all due to time, we\'ll be back tomorrow for an in-depth analysis of Twilight Princess on the Wii.